Digital Libraries have achieved a fundamental role in our knowledge society. By making the wealth of material contained in libraries, museum, archives and any knowledge repository worldwide available they are giving citizens in every place of the world the opportunity to appreciate their global cultural heritage and use it for study, work or leisure. They are revolutionising the whole knowledge management lifecycle. In this chapter, the history characterizing these “knowledge enabling technologies” is described. The history starts from the early attempts toward systems supporting knowledge discovery and reaches the current age in which a plethora of different realizations of digital library systems coexist. The evolutionary process conducting to the current, multi-instanced and still evolving status of affairs as well as the motivations governing it are identified and presented. The main initiatives and milestones producing the nowadays instances of these knowledge enabling systems are mentioned. Finally, the impact these systems had and are having on various aspects of our society is discussed. The digital library concept can be traced back to the famous papers of foreseer scientists like Vannevar Bush and J.C.R. Licklider identifying and pursuing the goal of innovative technologies and approaches toward knowledge sharing as fundamental instruments for progress. Bush (Bush, 1945) devised “a device in which an individual stores all his books, records, and communications, and which is mechanized so that it may be consulted with exceeding speed and flexibility.”. Moreover, on top of it there is “a transparent platen. On this are placed longhand notes, photographs, memoranda, all sorts of things”. Because of the lack of digital support, he identified in “improved microfilm” the means for content storage and exchange: “contents are purchased on microfilm ready for insertion. Books of all sorts, pictures, current periodicals, newspapers, are thus obtained and dropped into place”. Of course, he envisaged also support for knowledge discovery (“provision for consultation of the record by the usual scheme of indexing”), access (“to consult a certain book, he taps its code on the keyboard, and the title page of the book promptly appears before him”) and management (“new forms of encyclopedias will appear, ready made with a mesh of associative trails running through them, ready to be dropped into the memex and there amplified”). Licklider realized that computers were getting to be powerful enough to support the type of automated library systems that Bush had described and in 1965, wrote his book (Licklider, 1965) about how a computer could provide an automated library with simultaneous remote use by many different people through access to a common database. Because of this, Licklider is also considered a pioneer of Internet and in its book he established the connection between Internet and digital library. 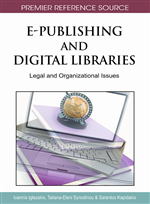 Thus, it is not surprising that research and development activity on digital libraries started in the early 1990s, with the Internet proliferation, and that Internet has created unprecedented possibilities to discover and deliver human knowledge.